University Ministry (UM) supports the spiritual, religious and pastoral needs of the University of San Francisco (USF) community. We enrich the USF experience by creating communities grounded in Ignatian spirituality and the Jesuit Catholic mission of USF. UM programs and services encourage USF students, faculty, staff and alumni of all religious backgrounds or none, to connect their faith, spirituality and values with an active engagement in the world, especially with economically poor and systematically oppressed communities, in order to realize the fullness of their humanity, and lead lives of meaning and purpose. Beginning on Ash Wednesday, March 6, Lent is a 40-day period of preparation for Easter. For Christians, it is a season of intentional spiritual renewal that calls individuals and communities to draw closer to God, and to concentrate more fully on prayer, reflection, service, and transformation. You might have heard the phrase, "What am I giving up for Lent?" Another way to engage the season of Lent is to ask "What am I doing for Lent?" Lent is an invitation to a renewed spiritual journey to discover new and deeper ways of living with integrity and purpose. Students, faculty, and staff of all faiths, or of no particular religious tradition, are invited to join University Ministry in these opportunities to deepen a spiritual practice, explore the richness of the Ignatian tradition, and discover new ways to be of service to our larger community. ♦ Taizé-style mediation services will be offered each Tuesday over Lent. Taizé prayer is offered in the style of the Taizé community in France. It includes simple songs, readings, prayers, and time for silent meditation. ♦ The sacrament of reconciliation is also available during Lent. It is very possible to come at 6 p.m. for the Taizé prayer and have time for the sacrament of reconciliation afterwards. Please email Brian with any specific questions. ♦ Join fellow students and colleagues for a moving guided procession of the Stations of the Cross across campus. These stations will have a particular focus on themes of social justice and peace, and will be led by Donal Godfrey, SJ. Open to all USF community members, this space is available 24/7 for quiet prayer and meditation. Located on the ground floor of Toler Hall, next to the University Ministry office. Accessible by swiping your OneCard. Check in with your Resident Ministers to discover even more Lenten Events in the Residence Halls. THURSDAY, APRIL 25 4:30 – 6 p.m. The #MeToo movement, which took off in fall 2017, has changed the conversation on sexual violence. Catholics have not been major contributors so far, but Catholic Social Thought and feminist theology offer important resources for diagnosing the problem and moving forward. Julie Hanlon Rubio, PhD, Professor of Social Ethics at the Jesuit School of Theology of Santa Clara University, will explain how. This event is sponsored by University Council for Jesuit Mission. Co-sponsors include The Joan and Ralph Lane Center for Catholic Social Thought and the Ignatian Tradition, Diversity Engagement and Community Outreach (DECO), the President's Advisory Council on the Status of Women (PACSW), University Ministry (UM), and The Cultural Centers. Looking for someone to talk to? University Ministry has campus ministers available to meet 1-on-1 with students who would like someone to talk to. These ministers are not psychologists, but on-campus professional staff who are trained to be mentors and advocates to support students on a variety of topics. Need a mentor in your life to offer a listening ear? UM is open to students of all faiths, students who are spiritual but not religious, and students who do not have any religious/spiritual involvement. If you’d like to find out more, please stop by our office or contact one of the campus ministers. No one from CAPS available to talk right now? Don’t worry. Our campus ministers are located in University Ministry (lower Toler, right near the entrance to the residence hall) and are waiting with open ears. Not sure who to chat with? Each individual has a varied range of experiences that they bring to offer you. With two Jesuit priests, our retreat director, director of resident ministry, and the director of UM available to you, we assure you that you’ll find someone capable of meeting your needs. Please email Mara Nadeau for more information. No calendar events have been found. Please try again. 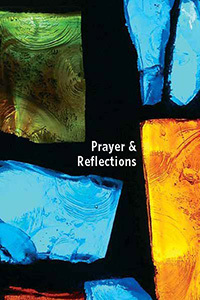 Visit the UM office (Toler 122) to pick up your copy of the Prayer & Reflections book!